Indeed, these are not the best of times for the social media giant, Facebook, as the company has been grappling with so many privacy issues and antitrust concerns. Now, Facebook has made public an embarrassing bug in its system that exposed about 14 million users private information publicly when they had intended to share them privately. According to the company, every posts made between May 18 and May 22, 2018 were mistakenly shared as public, even though the user had setup the privacy status. Facebook was only able to revert posts to private again after May 27, so it's likely that some sensitive information might have trickled onto the news feed of total strangers during the nine days the buy held sway. The bug was as a result of a new feature Facebook is currently testing, which would suggest that people share featured profile items publicly. Albeit Facebook mistakenly set "public" as the default for all posts, making posts shared during that period to evade users privacy settings. 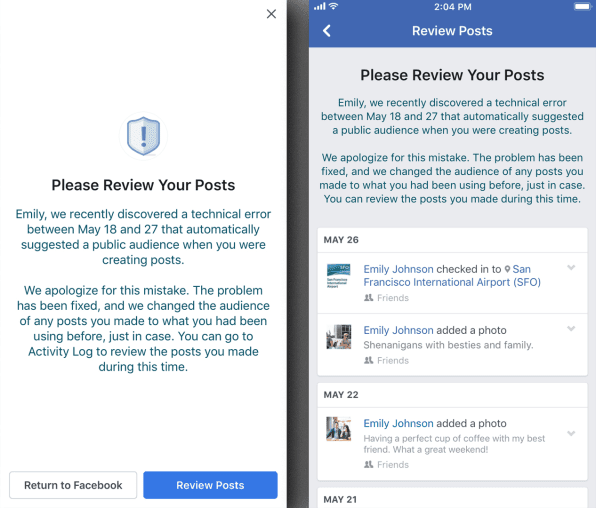 Affected users will be notified with a "Please review your posts" pop-up in their news feed, and will be required to review their privacy settings that might have been altered. Facebook, however assured users that the bug didn't impact anything posted before the stated period and that they still have the ability to choose their audience as before.